The portable objects used for contactless teleticketing applications are secured: their authentication and the modification of their content require the use of secret keys. These keys allow the terminals (sales, validation, control) to authenticate the data of a portable object presented (identifiers, season tickets, book of tickets, etc.) to protect the system against the use of unauthorized objects. Only the equipments possessing the keys may modify the content of the portable object (adding a contract, modifying the user data, etc.). 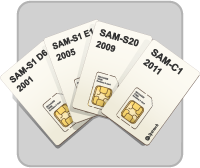 To remain secret, these keys are securely stored into the smartcards and the secure application modules (SAM). These SAM are the equivalent of safe boxes for the data and keys, controlling the access and usage of the key that they contain. The central system keeps track of the transactions, provides statistics and checks the system security and integrity. It may use a SAM to assess the authenticity of the transaction certificates. The vending equipment loads contracts (one-way tickets, season tickets, etc.) into the cards. It uses a SAM to secure this transaction, sign the data exchanged and certificate the information sent to the central system. The validator allows entrance in the transit network (and optionally the exit). 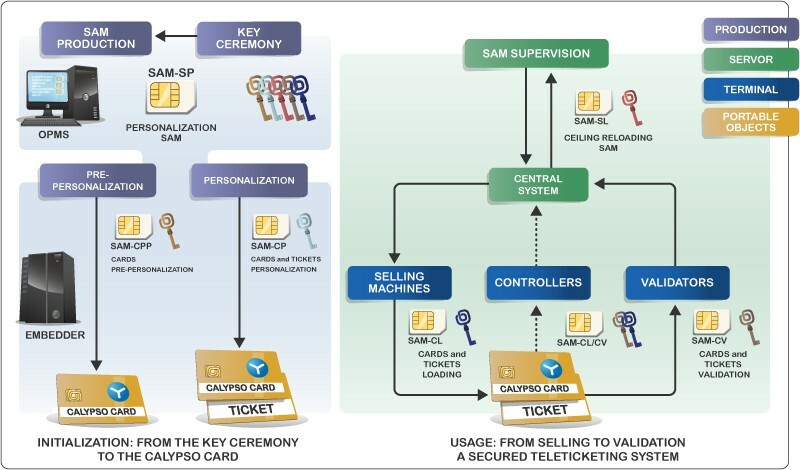 It uses a SAM to secure the transactions between the validators and the cards, to sign the data sent to the cards and tickets and the information transferred to the central system. Other types of terminals, such as hand-held control terminals, personalization machines, card manufacturing equipment, etc., may also use a SAM, configured in accordance to the operations that the terminal is authorized for. Improvement of the teleticketing transactions security with the Triple-DES and DESX cryptography. Performance and security for faster teleticketing transactions. Compliant with all Calypso cards and portable objects.